The application of a new paradigm medicine to clinical practice is based on the realization that the ordering-structuring factor in the universe Bohm called "in-formation," and traditional wisdom named chi or qi (or prana or etheric factor), is the key to maintaining the integrity and safeguarding the health of organisms. Clinical experience confirms the healing power of nature's information, and the importance of using it in addition to, or in concert with, established methods. The information contextualized by cells and cellular systems is not limited to the classically recognized bio-physiological aspects of the body. The content of the information that directs choices in the organism is supra-biological: in the last count, it is the effect of the cosmic attractor that forms and structures processes in the universe. It is now recognized that the causes of disease may be more than bacterial and viral: there may be deficiencies and imbalances in the organism that are not evident on the biochemical level. Subliminal psycho-emotional causes could also manifest as disease. And there may be personal lifestyle and environmental factors that impact negatively on the organism. These indicate inadequate in-formation by the attractor that structures systems in space and time. In-formation guides formative processes throughout the organism as well as between organisms. It acts on the epigenetic system, the system that guides the activation and suppression of particular genes--which in turn regulates the functioning of the whole organism. In acting on the epigenetic system--the system that determines the activation/suppression of particular genes--"in-formation" determines the response of the organism to the signals that reach it. In the embryo it determines the process whereby stem cells differentiate into normal cells (kidney, lung, liver, brain, and still other cells). Cellular differentiation involves a complex series of precisely sequenced steps, at the end of which every cell in the developing organism shares the same genetic code. Following cell differentiation in the embryo, the two codes remain aligned and use the same system to receive and decode messages. This enables the diverse types of cells in the embryo to "understand" each other. Molecules and other factors of the microenvironment carry information, and cells process that information, decoding and integrating it both in regard to its form and its content. The messages elicit responses, and the responses communicate information to all the cells of the body, whether they are proximal or distant. Communication among cells takes place when the cells are integrated in a body. Through the exchange of messages, cells constitute an integral cognitive network. This network processes information in all species of organism, including the simplest unicellular species. As already noted, the living organism is more than the sum of its parts. The integrality of the organism ensures that the various chemical and physical-chemical reactions are not expressions of separate events, but result from the fine-tuning of the organism to its intrinsic and extrinsic (internal and external) environment. It allows molecules and cells to adopt behaviors corresponding to their location within the system. The differentiation of DNA is indispensable for the re-programming of dysfunctional or downright malignant tumor cells toward benign behavior. The whole organism, with all its subsystems and organs, is an integral cognitive network, and in the case of a diseases such as cancer, information in that system is blocked: it does not govern the behavior of a group of malignant cells. The dialogue between the organism and that group of cells is arbitrarily uncontextualized--interrupted. The signification-codes have changed; they are not the same as those in healthy, normal cells. Cancer tumor cells organize their own behavior at the expense of the whole organism. Normally differentiated cells cooperate and their behavior is in harmony with cells in the rest of the organism, whereas cancer cells, not being adequately in-formed, may develop malignancy and adopt counterfunctional behaviors. However, this flaw can be corrected. If the organism is given access to the in-formation that maintains or contributes to the health of the organism, it can re-program its malfunctioning cells. It is known that during the phase of organogenesis (when the organs are forming) in the embryo, regulatory substances are present that correct alterations caused by carcinogens in the embryo's stem cells. These substances act on the epigenetic code that regulates gene expression in the embryo. They are stem-cell differentiation stage factors (SCDSFs), and they slow or stop the growth of a variety of tumors. 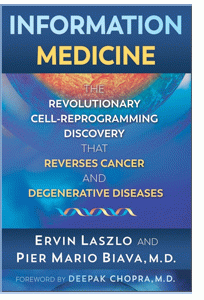 The behavior of tumor cells cannot be reduced to a problem of cells and genes. An explanation based solely on molecular mechanisms resulting from genetic activity and related growth factors does not clarify the nature of cancer. Cancer is a complex system where contact and communication with the flow of information among organs and systems of organs is interrupted, and the in-formation that structures and governs the living organism is inadequately accessed. As a result the health, and even the survival, of the organism is at risk. The key discovery of information medicine is that substances produced in the dialogue between mother and embryo are effective instruments for inducing the differentiation of mutant and degenerative stem cells in the embryo. These substances are precisely tuned to the embryo's developmental stage. When extracted and applied to stem cells in other organisms, including the human, they regulate the developmental program of stem cells in those organisms. Clinical evidence shows that cells obtained at precisely selected phases of organogenesis differentiate and reprogram cancer cells in the host organism, inducing malignant cells to mutate into normal healthy cells. The new discovery has been tested both in vitro (in the laboratory) and in vivo (under natural conditions). The testing has confirmed the discovery's effectiveness in cases of serious tumoral and degenerative diseases. About the Authors: Ervin Laszlo, Ph.D., is a philosopher and systems scientist. He has published more than 75 books and over 400 articles and research papers. He lives in Tuscany. http://ervinlaszlo.com/ Pier Mario Biava, M.D., has been studying the relationship between cancer and cell differentiation for more than 3 decades. The author of over 100 scientific publications and 6 books, he works at the Institute of Research and Treatment in Milan. The application of new paradigm medicine to clinical practice is based on the realization that the ordering-structuring factor in the universe Bohm called "in-formation," and traditional wisdom named chi or qi (or prana or etheric factor), is the key to maintaining the integrity and safeguarding the health of organisms. Clinical experience confirms the healing power of nature's in-formation, and the importance of using it in addition to, or in concert with, established methods. Sometimes we publish book excerpts.